A green card holder who served in the U.S. Army before serving time for a felony drug charge is entering the third day of a hunger strike in protest of his deportation. Chicago native Miguel Perez Jr. is currently being held at a detention center in Wisconsin for immigrants awaiting deportation. Perez’s protest began as a response to a federal court denying his appeal to remain in the United States after his release from prison after serving half of a 15-year prison sentence. Perez plead guilty to delivering less than 100 grams of cocaine after he handed an undercover officer a laptop case containing cocaine. A childhood friend who gave Perez free drugs and alcohol was also present during the crime. While Perez holds a green card, he thought he earned U.S. citizenship after he joined the U.S. Army and served two tours of duty in Afghanistan, thinking he had solidified his immigration status for life. He realized he was mistaken as his time in prison was coming to a close in September 2016. He was summoned to immigration court and moved to the detainment center in Wisconsin after his release. According to the Chicago Tribune, the veteran has called America home for the past 31 years, and fears that his deportation to Mexico would make him a target of drug cartels who target those with combat experience to work with them. Those who choose not to work with the cartels are usually murdered. “If it comes down to me being deported, I would rather leave this world in the country I gave my heart for,” said Perez. Perez becomes yet another face at the forefront of the ongoing immigration debate that has dominated American politics over the past few months. Perez has two children who were born in the U.S. whose living and family situations would be greatly impacted by his deportation. He also suffers from PTSD and was scheduled to be evaluated for a traumatic brain injury at a VA hospital before his 2008 arrest. In response to the appeal denial, Perez’s attorney, Chris Bergin, has filed a stay of his deportation based on his health concerns, and a request for citizenship retroactive to 2001, the year Perez joined the military. An appeal to the 7th U.S. Circuit court is being prepared and a pardon has been requested from Illinois governor Bruce Rauner. 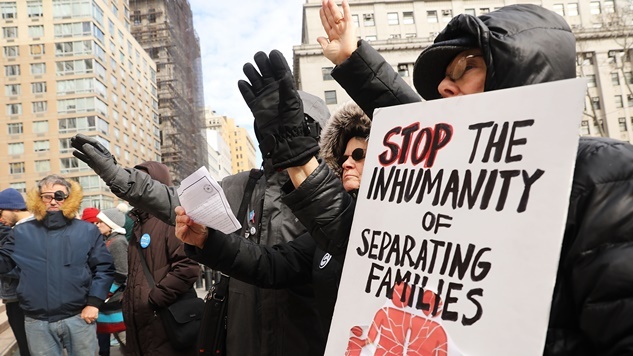 Every option is being explored by those supporting Perez, but his decision to begin a hunger strike has caused worry among those working to keep him in the country. “It’s pretty ridiculous that a veteran has to go on a hunger strike just to be able to stay … he’s definitely not getting the care he’s earned,” said Carlos Luna of the League of Latin American Citizens. Perez’s hunger strike began the day after President Trump promoted a renewed support of veterans and the VA during his State of the Union address.